The Mên-an-Tol (Cornish for ‘Stone of the Hole’) consists of a holed stone 1.2m (4ft) across with a large round hole 51cm (20 in) in diameter, large enough for a grown person to crawl through. Either side of it are two upright stones, 1.3m (4.5ft) high. There is also a fallen stone, and leading away around the edge the visible re-mains of other stones. What can be seen today are the remains of a stone circle, which probably originally consisted of 19 stones, as do the other circles in West Penwith. This circle, however, had the unique feature of a holed stone included. The precise location and function of this holed stone is unknown. It may have been moved at some time in the past, and indeed may once have faced at right angles to its present position. It may even have been the entrance stone to a burial mound, as it stands next to a raised stony area. The Mên-an-Tol lies beside a pathway that leads from a minor road that runs between Madron near Penzance to Morvah which lies on the north coast between St.Just and St.Ives. There is a small parking area beside the road, followed by a half mile walk up the lane. The site is signposted on the right of the lane, and is reached by climbing a stile in the hedge, which makes it unsuitable for disabled access. The holed stone has long been the subject of legends relating to healing and divination. Formerly known as the Crick stone, it was thought that to crawl through the hole nine times widdershins (against the sun or anti-clockwise) was a cure for backache, rickets and scrofula. Children would be passed through three times. Also, if a brass pin was placed on the stone, questions could be answered by the movement of the pin. It is sometimes used nowadays in ceremonies involving rebirth or transformation into other realities. The site probably dates from the late Neolithic-early Bronze Age (approx. 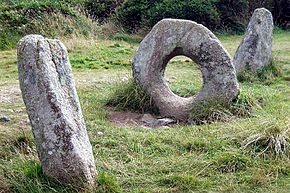 2500-1500 BC) as do the other stone circles in West Penwith, and was probably used for ritual and ceremonial purposes. The holed stone was obviously connected to the site in some way. The closeness of holed stones to stone circles is recorded at other places – for example at Tregeseal stone circle in West Penwith, and at the Stone of Odin, a holed stone that formerly stood between two stone circles on Orkney. They may have been used either as entrance stones to a barrow, or to give sightlines to other monuments and/or to the sun and the moon. If the holed stone here had been at right angles to its present position, it could have been used by the megalithic people to view the rising moon at its most northerly extreme (which only occurs every 18.6 years): seen from the centre of the circle, the moon would have been framed perfectly by the hole.